Sonic Live! is the seventh Sonic Special published by Archie. It includes three stories: "The Last Game Cartridge Hero", "The Substitute Freedom Fighters" and "Knuckles' Quest". On top of a tall tower on a dark and stormy night, Dr. Robotnik calls out to Sonic, issuing a challenge to have their final battle, winner-take-all. Sonic, not wanting to miss a challenge, dashes into the tower, arriving on the roof by slamming the door down. As another lightning bolt strikes, Robotnik and Snively turn around, revealing Sally, who has a mind neutralizer on that removes all conscious thought. Sonic tells Robotnik to leave her out of their battle, for it is only between the two of them and not Sally. Playing dirty, SWATbots arrive and circle Sonic. Sonic remains confident he can escape the situation, as Robotnik orders the SWATbots to take aim. They all raise their arms, aiming at Sonic. They are ordered to fire, and do so...successfully hitting Sonic, vaporizing him into thin air. With nothing left of Sonic, Robotnik laughs manically as he has finally defeated his arch-nemesis. In an alternate universe, real-life, a child named Steve is playing a video game, until he loses. Jessie, his sister, is watching, when their mother calls out to them to get ready for school. Although Steve wants to keep playing, they reluctantly leave the room to get ready for school...as a familiar white hand reaches out from the TV screen. Sonic, now floating in an alternate dimension, reaches through a green wall but can't get any farther. He pulls his arm back, floating around, realizing he can't walk around or do anything. Back in Mobius, Robotnik continues to gloat over his victory. With Sonic destroyed, or so he thinks, nobody can stop him from taking over the planet. Walking the princess, he goes into the tower and places her in a cell, one right beside a cell holding Tails and Rotor. They call out to her, but with the mind neutralizer on, she only stands, staring blankly at the wall. Back in Sonic's green dimension, he hears the voices of the kids again, returning home from school. He looks through the same wall that he put his arms through and sees Steve, trying to play his game, but finds that he can't control it. Jessie tells Steve that he put the VCR on, but he states that he hasn't touched it. He goes to change the channel, thinking it's on the wrong one, but Sonic calls out not to, afraid of being killed if he does. Needing help to get out, he reaches through the wall again, grabbing the arms of the children. He pulls them in, as they are surprised to see Sonic in person. He apologizes for bringing them in, explaining that they are in a zone between the real-life and his world, and that the energy allowed him to make contact with them. They look over and notice the same type of energy forming where they can return to Sonic's world. He grabs their hands and walks them over to the wall, hoping to return home to Mobius. On Mobius, in Robotropolis, Robotnik stands beside a small bridge leading to a rocket. He turns around and acknowledges the Freedom Fighters, who are being held prisoner by SWATbots. He shows off his missile, which he states will deploy a series of deadly satellites in the sky over Mobius, and will send the Freedom Fighters off into space. As the SWATbots take them into the rocket, they ask about Sally. Robotnik reaffirms their thoughts by saying that she was placed in a lower part of the rocket. All of a sudden, Sonic and the two kids appear in the hangar, right in front of a SWATbot. Sonic acts quick and takes it out, while two more SWATbots arrive and surround him as Robotnik walks over. He orders Sonic to stop, or he'll have the SWATbots destroy the children. Sonic believes he can get the children out of the way before the bots start firing, but Robotnik doesn't believe so, ordering a SWATbot to hold him. He taunts Sonic by pricking a quill out of his head, but Sonic retorts by slamming himself into Robotnik, with the SWATbots still holding. He then hits the SWATbots with a flurry of kicks and punches, freeing himself. He then runs over to the children and grabs them, jumping down to the bottom of the launch platform to access the control room for the rocket. Sonic furiously tries to find the controls to stop the rocket, but can't do so, as Robotnik, falling over, had hit the remote control for launching it. The rocket's engines fire, threatening to destroy everybody in the hangar, including Sonic, the children, Robotnik and Snively. Sonic eventually finds the shut-off control, but can't figure out which button to choose, while Robotnik and Snively discover a mysterious portal, similar to the one Sonic came out of. With a life-and-death situation at hand, Robotnik and Snively decide to jump into the portal to avoid the rocket's lift-off. With little time remaining, Sonic chooses one of the buttons, successfully shutting down the rocket. They leave the control room to help the others, but notice Robotnik has disappeared. Steve notices a glowing portal, similar to the one they entered from, suspecting he got away through it. Sonic is unsure, but the portal starts pulling the group in. Jessie is the first to get sucked in, so with no other option, Sonic and Steve give chase into the portal. The three of them drop onto a rocky surface, arriving in a completely new universe. They look up to see the unfriendly face of Robotnik looking down on them, gloating that he has them right where he wants them. With his SWATbots on hand, he orders them to surround the ground. Steve tells Sonic not to listen to Robotnik, but with them surrounded, Sonic keeps his cool, asking Robotnik what is up with the set-up of the dimension, as it has an artificially constructed building. Robotnik is pleased that he ask, ordering his SWATbots to lead them into the building. They enter a large room in the middle of the building, featuring a gigantic robotic Robotnik under construction by many different Robotniks from alternate universes. With his creation shown, he orders the SWATbots to take them away. All three of them are thrown into a jail cell...where they find even more Humans, who are quite surprised to see Sonic. In another room, Snively and Robotnik look over a large holographic map of Mobius. He explains to Snively that the Humans had constructed a multi-dimensional portal to their world in a form of "entertainment". With all the power he has at hand in this universe, he considers the loss of his satellites to be minimal. As he gloats about his power, the Robotniks from the other universes arrive, not pleased that Robotnik Prime wishes to keep all the power to himself. In the jail cell, the Humans explain to Sonic that he is not real, but rather a character in a game. They tell him that he started from a series of sketches that eventually resulted in his design. They believed this, until it was found out that the sketches were based on transmissions from a prototype device. Robotnik, meanwhile, arrives at the jail cell door, telling everybody to get back. The door explodes, allowing the team to escape, while 'Robotnik' takes off a mask, revealing a disguised female Human. Sonic is still confused as to how everybody came together, as one of the Humans explains that their device created a link between dimensions during an electrical storm. Robotnik stole the device and connected it to the systems in the building. They walk near the room, noticing the other Robotniks ganging up on Robotnik Prime, ready to destroy him. Despite their past, Sonic feels a need to save Robotnik. He runs in and saves Robotnik and Snively, just as the SWATbots of the other Robotniks fire on them. Although saved, Robotnik and Snively share their lack of sympathy with Sonic. Now, the SWATbots take aim at Sonic, Robotnik, Snively and the Humans. One of the Humans realizes that, if they can shut down the prototype system, it'll shut down everything. He points to a large controller pad on the wall, which he can put the code in. Sonic takes Steve, who knows the code, and rushes through the SWATbots to the control panel. Steve states the code, as Sonic pushes the buttons. The code works, shutting down all the SWATbots in the building. 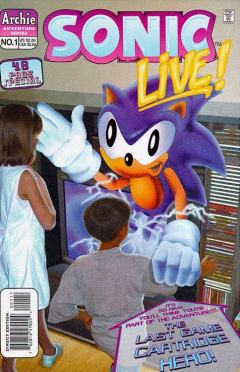 Everybody congratulates Sonic, while he thanks the kids for their help. Steve, however, is also concerned about how to get home. Sonic believes that Rotor is likely coming up with a solution, but that the best way to get back home would be from this universe itself. The Humans believe they can reverse the prototype to bring them all back to their universes, but that would be a one-way trip. Steve and Jessie hug Sonic, saying they'll miss him, but he knows that they'll be able to keep up on what he is doing by buying the next Sonic game. Sonic, Robotnik and Snively step on a transporter pad, as the Humans send them back to their world. Back on Mobius, the Freedom Fighters, now free from the rocket, greet Sonic, while Robotnik and Snively leave the area. Meanwhile, back in real-life, Steve gets the newest Sonic game, allowing him to keep up on Sonic's doings. This story leads up to the events of the Freedom Fighters being captured by Robotnik in the above story, and how they were able to escape. In Rotor's lab, Rotor is working on a microscopic object while the rest of the Freedom Fighters, minus Sonic, arrive, wondering what he is doing. He shows off the object, a small camera that he can attach to his belt to monitor their actions in combat. Using the information they transmit back to the Knothole computer, they can review their skills and improve them. Rotor, however, is unsure if the camera will work, attaching it to his utility belt. Coincidentally, the perimeter alarm goes off, alerting the Freedom Fighters that SWATbots are at the outer perimeter of Knothole. They rush out to take care of the SWATbots, and allowing them to test the camera. Their battle doesn't go well, as they are captured and sent to Robotnik. Later on, Larry Lynx arrives, entering Rotor's lab. Seeing nobody, he decides to leave, until the camera on Rotor's belt starts a feed on the monitor in the room. Larry turns around and sees Robotnik talking, stating about having captured the Freedom Fighters and Sonic being dealt with. Larry freaks out, unsure if he can do the job of a normal Freedom Fighter, until he looks over at another monitor. He sees a number of the other Freedom Fighters training in a boot camp in Knothole. He runs to the boot camp, calling for help, getting the attention of Cyril the Eagle, Arlo, Hamlin, Penelope and Dylan. Panting from the dash over, he informs the group that Dr. Robotnik has captured the Freedom Fighters, and that they must save them. Cyril decides that they need a plan, but with very little time to save them, Larry tells them to make the plan up as they head of Robotropolis. They arrive at the outskirts of Robotropolis, hiding behind some rocks from a group of SWATbots. Larry crawls toward the bots, as he has an idea on how to stop them. The SWATbots notice Larry and surround him. As Larry refuses to surrender, they fire on him, but due to his bad luck, they end up hitting each other instead. Cyril flies up ahead to check for a clear path, while the others grab the SWATbots' weapons. Once Cyril confirms the all-clear, they proceed into Robotropolis. They arrive at a door leading into the large hangar bay, but it is locked. Dylan takes out one of his quills and uses it to jury-open the lock, allowing them access into the building. Right as they enter, a legion of SWATbots marches at them. Cyril calls out for maneuver 12, as Hamlin, Arlo and Penelope drop their weapons. Hamlin rolls into a ball and Arlo and Penelope toss him at the legion, destroying them. They pick up their weapons again and walk along a catwalk, noticing Sonic down-below being held by two SWATbots in front of Robotnik. Larry notices the rocket nearby, and tells the others that Sonic can take care of himself. They battle through many SWATbots, eventually reaching the entrance to the rocket. They enter, releasing Sally from her mind neutralizer and freeing the Freedom Fighters. They escape the building, waiting for Sonic to return. The next day, in Knothole, Sally commends the other Freedom Fighters for a job well done, giving them watches so they can alerted if their help is ever required. For his quick thinking, and for reinforcing the idea that they need an emergency back-up team, Sally awards Larry a metal and announces him as leader of this new team. Larry is unsure as to what to say, but Sally answers for him, telling him to say yes to being the leader of the new Substitute Legion of Freedom Fighters. Now on his own quest to find the royal sword to help cure the ailing King Acorn, Knuckles has arrived in a remote section of the Great Forest. This section contains a cottage, long forgotten and untouched since the creation of Robotropolis. As he approaches the cottage, a large menacing pitcher plant-like creature known as the Devil Watcher appears. Knuckles recalls hearing about it as a fairy tale, but now as a real threat, he must defend himself to continue his mission. He punches a nearby tree, sending it crashing down and stopping the threatening plant. He enters the cottage, realizing that it is much larger on the inside than it looks outside. He enters a rocky room lit with torches and has a large wooden table. As he walks in, two cheetah-like animals called Blood Beasts pounce in front of the echidna. Recalling from tales in the past, he knocks out the dominant creature to dissuade the others. Mysteriously, once he hits them, the Blood Beasts all disappear. As he turns around, even more mystical creatures appear, including a large beast, a dragon, and a skull-creature. Using his strength, he is able to dispose of each of these creatures, causing them to disappear. He wonders where all these creatures are coming from, recalling the message the Ancient Walkers told him, about meeting various creatures, one of which is a charlatan, a storybook creature. Realizing that part of the message, he looks up to two of the incoming creatures and apologizes for his intrusion. His idea works, as the creatures disappear, but a mysterious creature near the cottage's bookshelf appears, knowing that Knuckles has seen the Ancient Walkers. The creature, the charlatan in the Ancient Walkers' message, turns around and mentions that he uses his powers to protect himself. He also shows off a picture above the bookcase, showing him with the King. When the King was active, he acted as the King's bodyguard. Although unaware of the location of the royal sword, he shows Knuckles a book detailing the location of the Land of Dark, where somebody may be able to help him. However, the charlatan is unaware of the location of this land. Before Knuckles leaves, the charlatan tells him that, if he ever sees the King again, tell him that Merlin Prower wishes him well. Knuckles leaves the cottage, now with his next objective in hand, quite intent on making sure he can deliver that message. This issue features a real-life cover and a number of real-life images. The children shown in these images are Ken Penders' children. Although Steve appears to be playing a video game, the controller he is using is the television remote control. The title of "The Last Game Cartridge Hero" bears a similarity to the title of the movie Last Action Hero. The Last Game Cartridge Hero also borrows a plot aspect from the movie, bringing children into a video game. In the movie, the child protagonist is brought into an action movie. The access code to shut down the prototype is the level select code for Sonic 1. Larry Lynx and Cyril the Eagle return, last seen in issue 12. Merlin Prower, Tails' uncle, is introduced.